Pixel or pica, computer screen or printed page, the written word is increasingly a medium with a worldwide impact while English continues to be one of the most widely used idioms. LOQUENCE PROVIDES TRANSLATION AND EDITORIAL SERVICES to ensure that your ideas and your words have their maximum impact in such an international context. 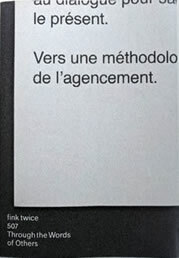 Whether translating from the French or the Italian, editing a piece in English, or drafting copy for a new undertaking, Loquence brings to the technological advances of the 21st century the exacting standards of the wordsmith‘s craft, the firm grasp of grammar, the attention to detail, the fine ear for the balanced phrase. Through the Words of Others is a personal reflection by Stéphanie Serra on libraries, her own library, and the books that mold and mature one’s intellect. Serra’s essay contains multitudes, multiple passages from authors who are foundational for her. A study of the power of books through the lens of her library. Responsible for the English version, I became legion in turn as I rendered a text interlaced with quotations from a range of authors already translated by other hands.